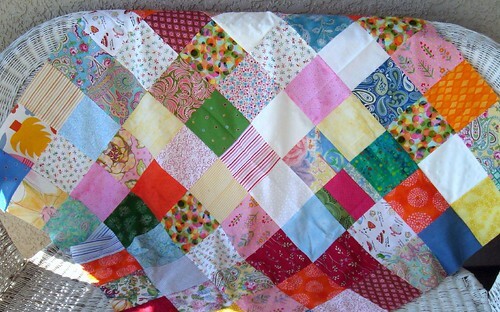 Just a quick patchwork quilt top. I'm not yet sure how I'm going to finish it, either straight lines "in the ditch" or random free-motion quilting. The inspiration fabric is the dragonfly fabric in the center of the picture below. The rest of the quilt is pretty dang random and scrappy. I'm not sure how I feel about it ... the very business of it kind of scares me, and a few of the seams are way off, which makes me very unhappy. But the colors and patterns are so cheerful it's hard not to like it at least a little bit! I don't see any seams not linging up perfectly. I guess it's a good thing I'm not terribly picky about that because mine hardly ever line up right! It looks fantastic and I agree with Erin K - they all look like they line up to me...I'm horrible at that! 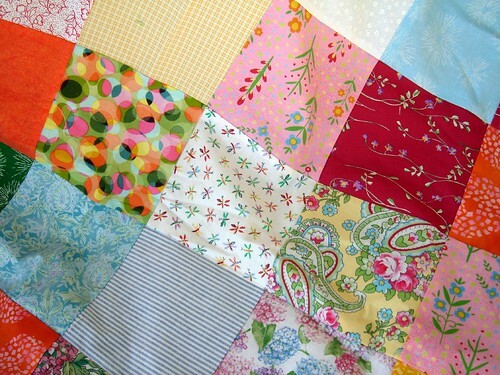 i love random, scrappy quilts just like this one.